It is our honor to be recognized in the community for serving our mission to provide the highest level of service to our clients, while also giving back to meaningful causes and empowering our employees with opportunities to help them thrive. While awards affirm our dedication to excellence, our team’s greatest motivation is to continually provide our clients with a superior experience. We’re proud to celebrate these achievements as a reflection of our commitment to that mission, along with your role in driving our success. It’s not only recognition for us, but also all of you who assist us in these endeavors. 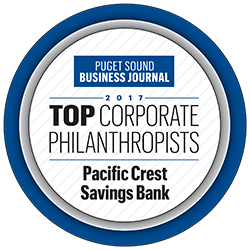 We are honored to be recognized again this year as one of the top 25 companies on the Puget Sound Business Journal’s Small Business Corporate Philanthropy list for 2018. Our incredible employees have spoken! Pacific Crest has been recognized as one of PSBJ’s Washington’s 100 Best Workplaces for two years running.